With the din of helicopters overhead, a 10pm curfew, and Oakland’s dubious distinction- of all the nation’s Occupy Wallstreet protests- of being the City who used an embarrassing amount of force to remove a group of campers from its downtown, there is much to be disgusted by. With the din of helicopters overhead, a 10pm curfew, and Oakland’s dubious distinction- out of all of the nation’s Occupy Wall street protests- Oakland is the one City who used an embarrassing amount of force to remove a group of campers from its town center. Disgusting and frustrating. Yesterday, around lunch, I went back to downtown to run errands, and had to detour several barricade zones to get close to the block where my credit union was. There were no protesters, no activity, but the police presence was around 100. (?!) A motorcycle brigade kept circling the block. I watched the officers as I approached Clay Street (near the site of the protests). How would you expect a police force to look the morning after a confrontation with a group of mostly student protesters? It was hard to believe, but they were standing about- joking, laughing and posing for pictures. I guess enjoying their 15minutes of fame in the world news. This scene filled me with rage. Here is our police force, gloating, no doubt collecting overtime from a city on the verge of bankruptcy; the same force who paid for a 17-city back up on (= an exaggerated response) to “handle” a small crowd on 10/25. Here is the police force who cannot manage our city’s daily violence, standing around joking & posing for pictures after a night of mis-handling a peaceful protest. Nauseating. Watching the videos around the web, it looked like the police were actually really angry about something as they worked; it was a surprising level of anger from the police side. You could see their anger in the way they destroyed the encampment; the way they dragged tents to the street- with sleeping people in them; the way they aimed their tear gas canisters AT protesters. 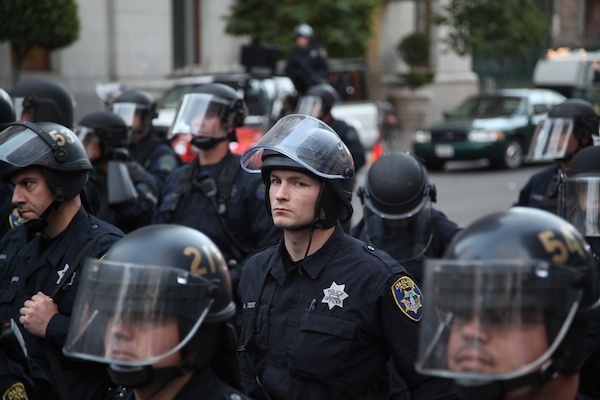 Are police immune from the economic issues that affect the rest of the world? It made me ask– Hey Oakland PD- who/what are you fighting against here?! What are you so angry about? When I researched where politically the city of Oakland is (we just lost our Police Chief a couple of weeks ago); a possible explanation emerged. Oakland PD is often in the news- gangs, excessive force both. But I didn’t know how close Oakland is to being taken over by the Feds (receivership they call it). It seems they can’t convince the courts that they want to change- not even on paper. The italicized words in this poem blow are taken from the Oakland PD’s Mission statement (and from other police city’s mission statements that helped them the night of 10/25). from crime explode you out with a hundred flash grenades.